Greetings everyone! First, a little business before I get into the interview…I want to let you know that my workshop in Zephyr for this September is full. I do have a waiting list going, please contact me if you want to be added to the list. Also, I am happy to announce that we have a new page on our blog, called “Publications”, that lists the different places that the 3 of us have been published….books, articles in magazines, etc. I hope you’ll check it out! 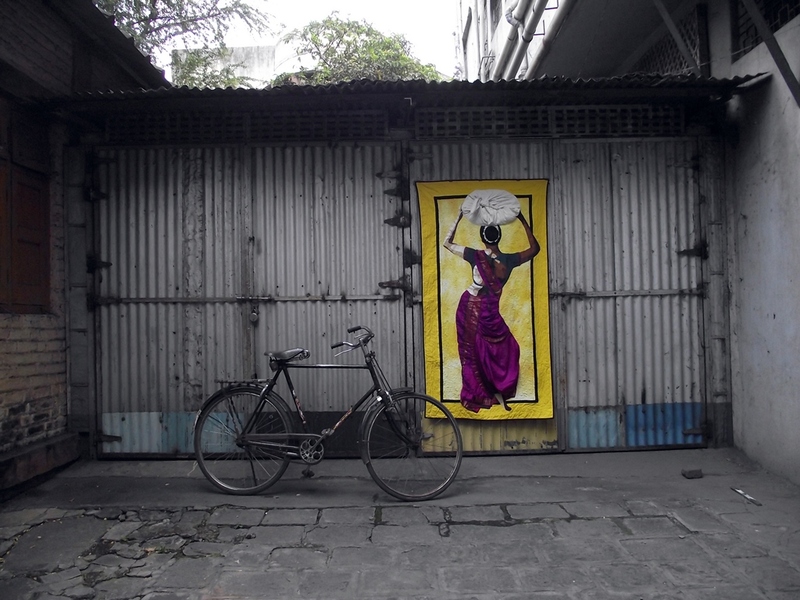 I am writing today about my friend, Shruti Dandekar. I have to tell you how we met, as it is a testament to the power of social media. Shruti found me on Facebook, she actually saw my self-portrait quilt online and contacted me since she was considering doing a quilt portrait herself and wanted my input. We started a conversation online, one in which she was always 12 hours ahead of me 🙂 She interviewed me for her blog, which resulted in my getting a contract to teach at the Desert Quilters of Nevada in Las Vegas earlier this year. When she told me she was coming to the US to attend QuiltCon in Austin, Texas, I encouraged her to come visit and stay at my house for as long as she could, which turned out to be about 36 hours, which we filled every moment with! As it happened, the day she was here was a MAQ meeting day (Mountain Art Quilters), which of course I had to bring her to. She did a wonderful, spontaneous talk about her career and experiences as a quilter in India. She had such an interesting perspective and all MAQ members listened intently to every word. 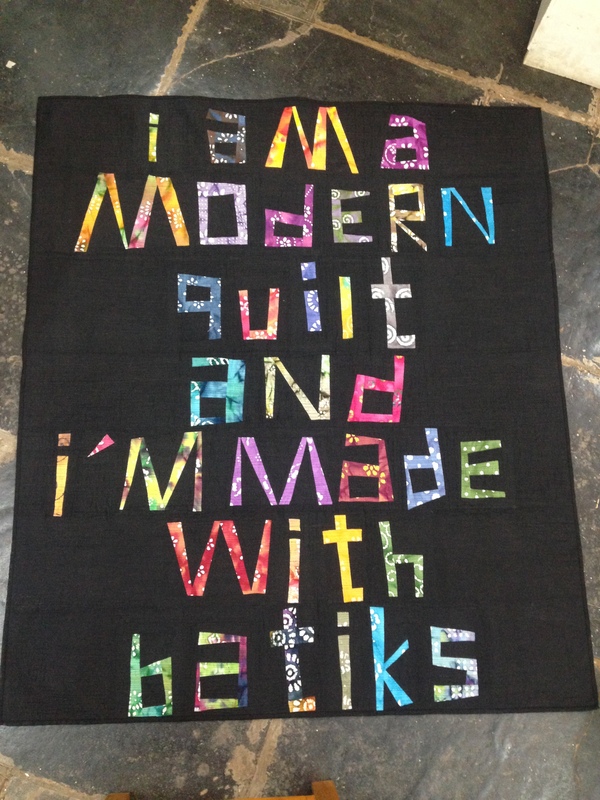 I would call her a Modern and Art Quilter. 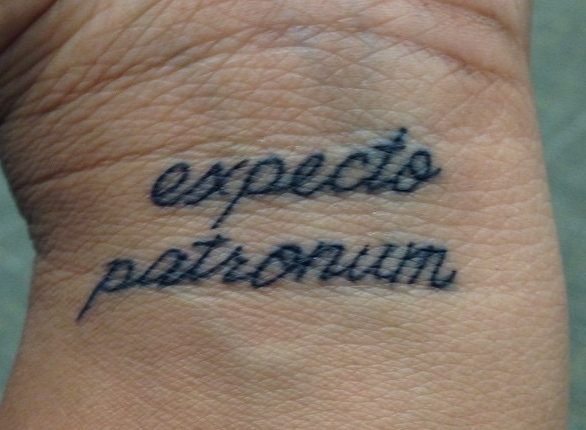 I love the photo below that she sent me. Shruti, tell me a bit about your background. Living in India, how were you introduced to quilting? “Quilting just happened accidentally for me. I was at the peak of my career in 2009 when a bout of Chikungunya left me out of job and in severe joint pain. I started getting stuff made from old clothes – mine to start with, and soon was flooded with requests from friends and family. There was a point when 40 women from the slums from my town were working for me. Unfortunately (or maybe it was a blessing in disguise) the venture dwindled down and I was left with my grandmother’s sewing machine (which I did not know how to use) and boxes full of ‘stash’. My cook doubled up as my teacher and taught me how to use the machine. If anything went wrong after she had gone home for the day, I had to wait till the next day for her to arrive and help me with it. What hurdles do you have to jump over to get your hands on supplies, such as fabric, notions, and batting? What is it about Modern quilts that attracts you to quilting, as opposed to more traditional quilts? What do you think is the future of quilting, in India, and around the world? “I have been a part of the online quilting community since 2010. Over the past 5 years I have seen trends change – Blogging was huge when I started out, but today, it has taken a backseat and ‘instant’ social media is much more popular. There have been trends in fabrics, even colours! Quilting is more widely being accepted as ‘art’ rather than a domestic skill. With people like Luke Haynes and Jean Wells breaking the barriers between quilting are art, more and more people are accepting it for what it is = an art form that involves tremendous creativity and efforts. What was it like to come to the US and attend QuiltCon? What struck you the most about the quilts you saw on display? “My trip to the USA was a dream come true for me. I had been saving up for the trip since two years. Half of whatever I earned went into my ‘QuiltCon Savings Account’ irrespective of my expenses for the project. I have even put aside Rs 5 (less than 1 cent) at a time! Not only was this trip my first trip to any ‘quilting’ event, but it was also my first solo trip abroad, my first trip to the other side of the world. I loved the fact that wherever I went, I was greeted with a warm hug and a dazzling smile. People went out of their ways to help me, make me feel at home. The quilts at Quiltcon were mind blowing. Up until this point, when I said my quilts were the best, nobody could challenge me. There was nothing I could compare my quilts with. This trip not only gave me a point of reference, but also gave me an opportunity to learn how to improve my work and take it up a notch. The quilt show at Austin was and eye opener for me. I spent hours looking at the quilts (sometimes even bunking the lectures I had signed up for), totally under their spell. I met the people who had made them, talked to them and loved how open and generous they were. 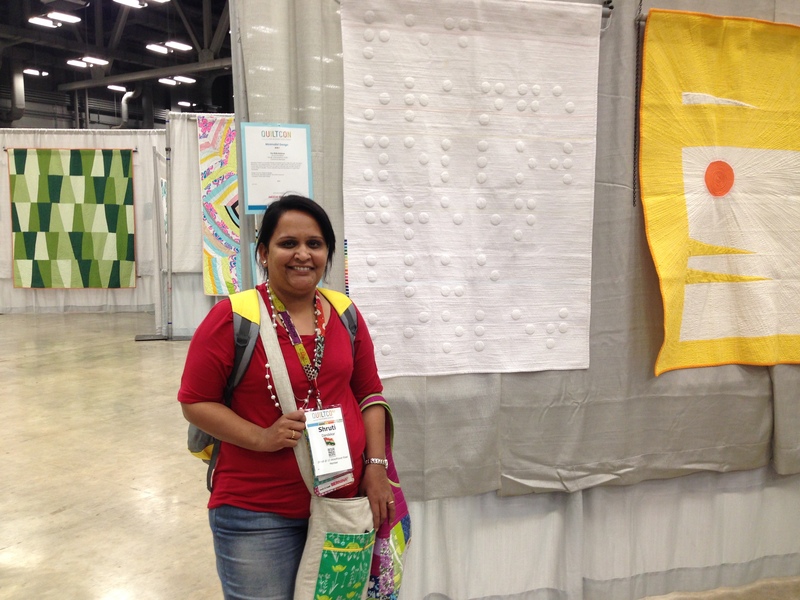 Here’s Shruti in front of the quilt she had in the QuiltCon show, which was purchased! It is actually Braille. Shruti has quite a sense of humor. This is evidenced by the following quilt of hers, and also by a tattoo she had put on her wrist while she was in Texas. 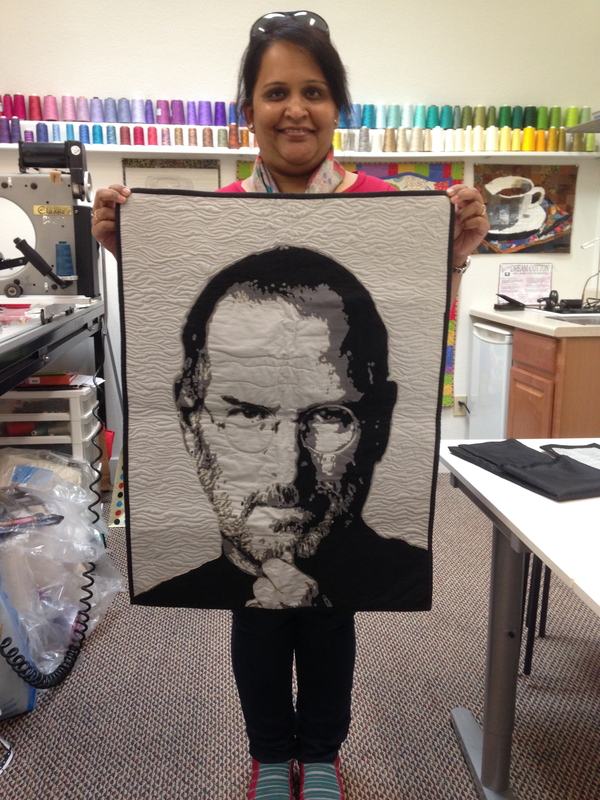 I took this photo when Shruti came to my longarm studio, this is her piece of Steve Jobs that she gave her brother, a fan of his. 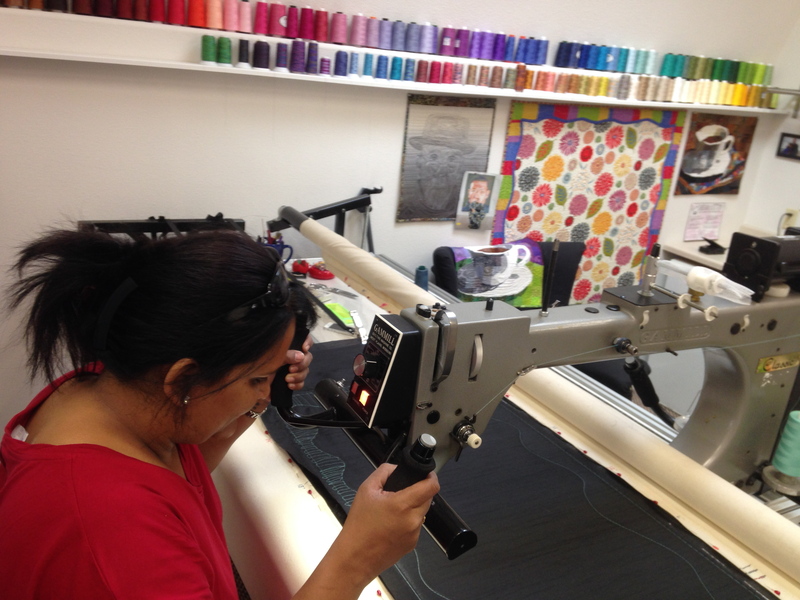 Shruti was a natural on the longarm, as I suspected she’d be! I hope you’ve enjoyed reading about Shruti. I look forward to continuing our relationship and hearing about what she’s doing in the quilt world. I expect more great things from her! Who knows, maybe one day I will travel to India and visit her and her beautiful country. She is also on Facebook, of course! This entry was posted in Sandra Bruce and tagged QuiltCon, quilting, Sandra Bruce, Shruti Dandekar by artisticalchemy3. Bookmark the permalink. Shruti,thank you! We must meet again!